Purity and functionality of the anti-CD3 F(ab′)2 . (A) The purity of anti-CD3 was assessed by staining with Coomassie blue brilliant. (B) ELISA experiment to compare the binding capacities of the purified nonmitogenic (NM) F(ab′)2 and full-length anti-CD3. (C) The half-life of the CD3 was evaluated in vivo. After i.v. injection of 200 μg into mice (n = 6), 50 μl blood was taken daily and the presence of anti-CD3 F(ab′)2 in the serum assessed by ELISA. NT, nontreated. 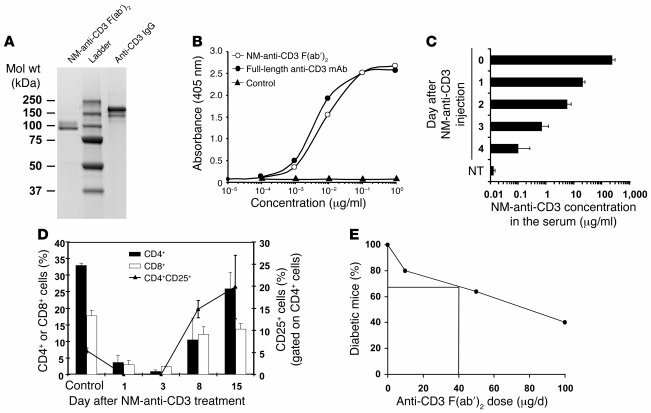 (D) In vivo activity of the NM anti-CD3 F(ab′)2 was evaluated in RIP-LCMV mice (n = 6). Blood samples were analyzed days 1, 3, 8, and 15 after treatment with anti-CD3 alone and their contents in CD4+, CD8+, and CD25+ T cells compared with those of untreated and uninfected RIP-LCMV mice (control). (E) The efficacy of our commercial anti-CD3 F(ab′)2 was controlled by treating NOD mice after new-onset diabetes with 3 Ab doses (10, 50, and 100 μg/d, 5 consecutive days). The percentage of mice showing long-term remission was calculated and is shown in the figure.